tl;dr Went to hackathon; Hacked like women; Won. Last week I went to my very first Hackathon – Hack Manchester 2018. I was invited by the wonderful Clare Sudbery (a stop on my coding tour, and my remote evening pairing partner for a hobby-project puzzle game app). 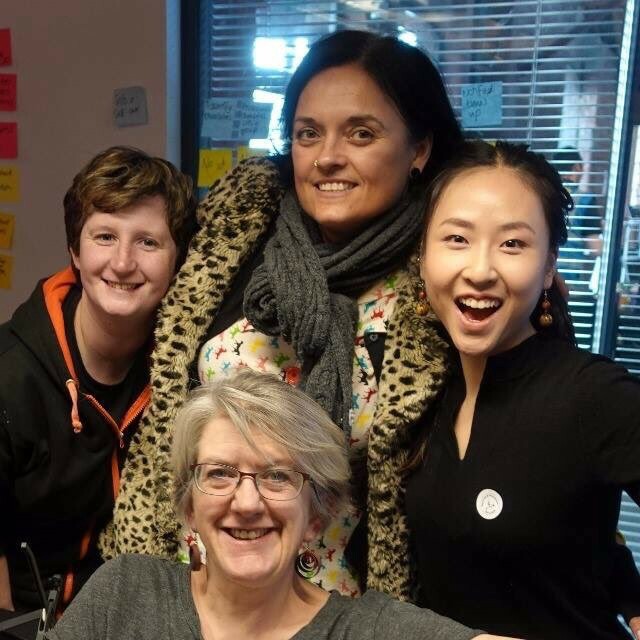 Clare put together an amazing and talented all-women team, including her SheSaysManchester mentee Luce Carter and her colleague at ThoughtWorks Cynthia Lee. It was the first time that most of us had ever met in person and we only had 25 hours to hack together a product. Clare’s blogpost describes the Time Machine we made and you can take a look at the code via the readme here. One of the things that was raised in the award ceremony was that we behaved quite differently to your average hackathon team. No multi-packs of super-powered caffeine drinks, no bravado, no “seeing who could go the longest without sleep”. One the things we all agreed about in advance was the importance of self-care – I even brought some calming essential oils that we sprinkled on our tablecloth! Luce was adamant that we all got some sleep, so we discussed our optimum sleeping cycles and on the day, Luce and Cynthia left about 9pm but came back super early, I dropped around 1am and Clare (who just can’t put a coding problem down) went home around 4am but came back in a little later the next day. I reckon there wasn’t much more than an hour with no-one at all looking at the code. We used very light-weight agile techniques, just enough to keep us on track and remember to take proper care of ourselves. We paired almost the whole time, rotating pairs every hour. After a few rotations we decided to “anchor” one person from each pair on a particular aspect (mostly, but not entirely “front end” vs “back end”) and have the other two swapping and sharing knowledge. We swapped laptops every time we swapped pairs, to make sure updating one machine was never too arduous. We created a (sort of) User Story Map to understand what our “minimum viable” looked like, ticking off the stories as they were completed. We then copied out a couple of stories into a 3-column board for each one-hour “iteration” that we did. (You can see the “done” column here behind me on the left, we didn’t clear it down at the end of each iteration – it made us feel good to see it full). At the end of each one hour iteration we did a 5-minute quick and dirty “review -retrospective hybrid” (“What did you get working? Give us a look! What should we change? ), and then had a ten minute proper break away from our table. Given the super-tight time constraints that seems crazy I know – “wasting’ a quarter of the available time, and then in addition slacking off to get some sleep – but we are all absolutely convinced that these high-pressure environments make self-care, sustainable pace, and stepping away from the keyboard even more important than usual. Plus we often stepped back to our table with a new idea or a fresh approach. The atmosphere on our team was a wonderful mix of hilarity (we were making a time machine after all), positive re-enforcement (we were all so stoked when things worked and voiced our appreciations with “oohs” and “ahhs”) and empathy (checking in with each other). And we flexed. Nothing was set in stone – for example on Sunday, when I was saturated from collaborating, it was just fine for me to work on my own for a bit with my headphones on. Sadly I missed the Awards Ceremony as I needed to take the 5-hour train journey home to my family, but I got back just in time to flip on the live stream half way through and see the announcement that we had won Best In Show (the first ever all-women team to do so), with my lovely team-mates waving at me from the stage. The announcer said something along the lines of “They are not winning because they are women, but because they are brilliant developers”. I am of course very pleased that they were clear that our gender hadn’t influenced the judging, but I’m not entirely certain that hacking like women wasn’t key to our success.